We’ve joined partners from across the state to celebrate the release of The Opportunity Index, a new 50-state ranking release by Opportunity Washington. The Index is a data-driven analysis of state performance in the three priority categories of Achieve (education quality and outcomes), Connect (transportation system reliability and efficiency), and Employ (economic vitality). 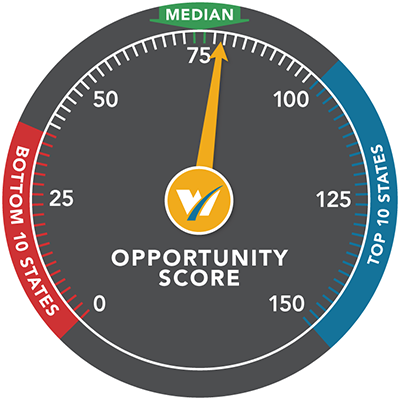 The Opportunity Score is based on 16 variables across the three categories compiled for each state. Scores can range from 0 to 150+. The median score is set at 75 and the 10th best state is 100. Washington turns in a good – not great- performance; ranking 24th among the states with an opportunity score of 79. In short, Washington is stuck in the middle, not bad, but not great. Opportunity for some, not all. There’s plenty of room for improvement. We invite you to join Opportunity Washington’s efforts by signing up at www.opportunitywa.org and following Opportunity Washington on Facebook and Twitter.